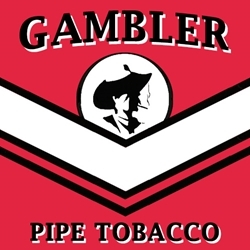 Gambler Pipe Tobacco offers a smooth and mellow taste of blended fine cut Burley and Virginia tobaccos focusing solely on traditional taste and strength, without the harsh aftertaste. A staple brand of the elite smoking class, Gambler’s straightforward American blend still has the ability to deliver a fine quality tobacco everyone has grown to love over the years. Gambler Pipe Tobacco is manufactured and distributed nationwide by Republic Tobacco, Glenview, IL USA. Each pouch of Gambler Pipe Tobacco are available at our online tobacco store in unique styles to choose from. Mellow, Mint, Regular and Light Pouches. Smoking connoisseurs everywhere are changing their ways and choosing this premium tobacco smokes as a great alternative to expensive and over-priced retail brands. Gambler Pipe Tobacco is a great option for your money saving needs. Smokers Discounts has made it easy and affordable to buy pipe tobacco online. Call us for more details!